She blinded US with Science! (deep voice) SCIENCE! She's capital! 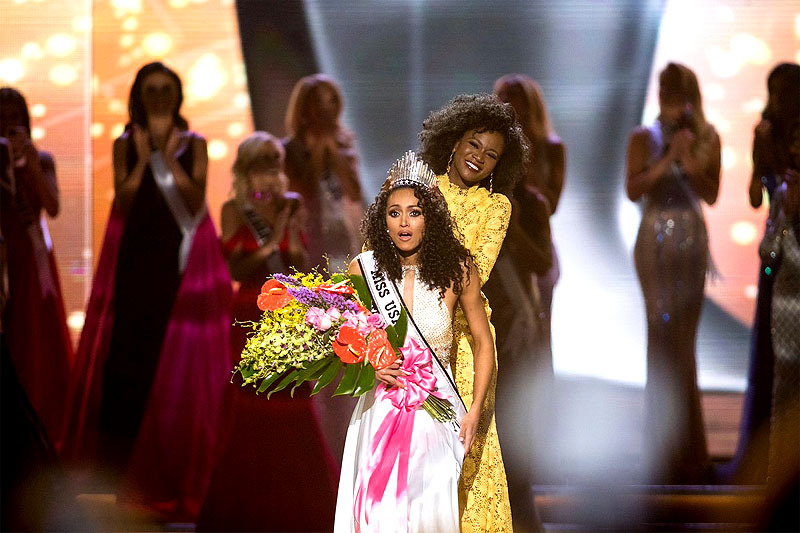 Kára Deidra McCullough has won a successive Miss USA crown for the District of Columbia giving them the first back-to-back wins since Texas won five crowns in a row from 1985 to 1989. The last woman to win back-to-back crowns was Texas’ Gretchen Polhemus in 1989 who herself became a central figure of the 2017 Miss USA pageant but we’ll get to that later. IMG has owned the Miss Universe family of pageants with the 2015 year being the transition year and the 2016 Miss USA pageant was the first under their ownership which resulted in some sweeping changes. 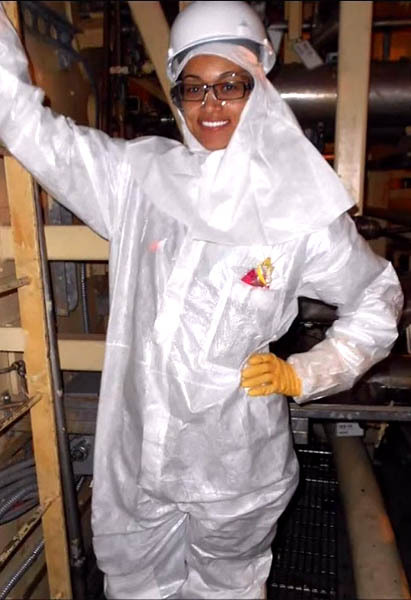 The IMG era of pageantry has made it clear that Miss USA must be an achiever and Kára certainly is as she is a scientist working for the United States Nuclear Regulatory Commission. Born in Naples, Italy as an army brat and like her predecessor, Deshauna Barber, Kára also comes from an army family with her parents serving in the United States Marine Corps. As a result, Kára has lived in many countries worldwide. Interestingly enough, Kára was actually the 1st runner up to Deshauna Barber at the Miss District of Columbia USA 2016 pageant and Kára was even runner-up at Miss DC USA 2015 as well before winning the 2017 crowns for the nation's capital and now... the nation! This is the fourth Miss USA win for the nation's capital succeeding those of Bobbi Johnson in 1964, Shauntay Hinton in 2002 and Deshauna Barber, Miss USA 2016. 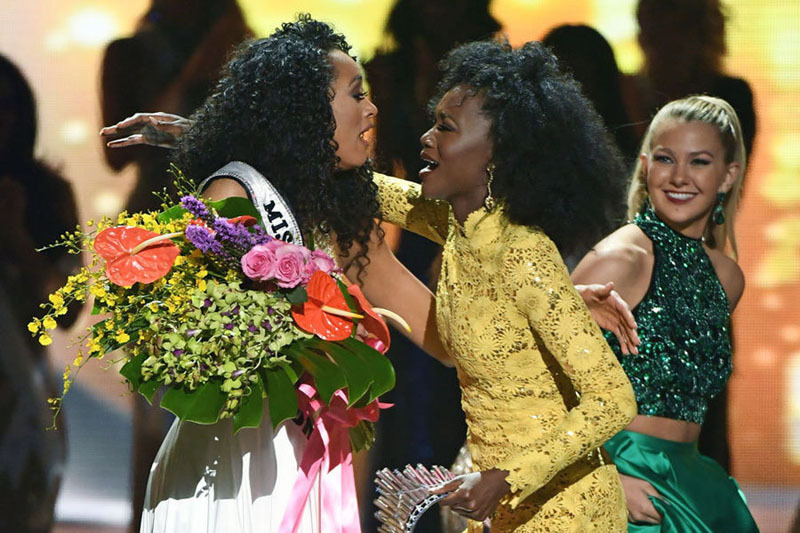 This is also the first time since 2008 that we had two successive black winners in a row as Deshauna and Kára have repeated this feat after it was first achieved when Rachel Smith and Crystle Stewart won successive Miss USA crowns in 2007 and 2008 respectively. You’ll also notice the distinct accent in Kára’s name so it is pronounced more like Kyra so that is another interesting aspect about our new queen. This year, there were a few notable changes. The pageant returned to its regular two-hour format after having a three-hour pageant from 2014 to 2016 but this also meant a reduction in the number of semifinalists. Only 10 advanced to compete for the title of Miss USA which hasn’t been done since 2003. 2004 to 2015 had at least 15 semifinalists but 2014 had 20 semifinalists and 2011 and 2012 had 16 semifinalists. Nine of this year’s semifinalists were selected by the preliminary judges and one was selected through the Internet vote. Although it wasn’t revealed who won the Internet vote during the telecast, I have a feeling it was Missouri as she was the biggest surprise in the top 10 and at Miss Teen USA 2013, Missouri’s Brenda Smith-Lezama also advanced due to the Internet vote so this is a likely scenario. The Photogenic award was not announced during the telecast so it looks like that award was discontinued. Yet another sign of the times. The Congeniality award also wasn’t announced during the telecast but a press release after the pageant revealed that Missouri and Wyoming were co-winners as there was a tie for the Congeniality vote. This year’s pageant was also held in the month of May on Mother’s Day, May 14. There was a significant dip in the ratings this year also so maybe Mother’s Day wasn’t an ideal date to have the pageant. Also, the announcement of the venue and confirmation of the date was very delayed this year so there wasn’t a lot of pre-pageant promotion. There was a rumor floating around that this year’s pageant might be held in Cleveland, Ohio but it looks like they probably bailed as has been the case for a lot of potential host venues in recent years such as Panama pulling out of hosting Miss Universe 2013. Recently, Miss USA has been held usually in June, except 2015 which was held in July and it hasn’t been held in May since 2010. This year’s Miss USA pageant had approximately 3 million viewers which was down from last year’s pageant which had 4.3 million viewers making this year’s pageant the lowest rated after the controversial 2015 pageant which was abruptly moved from NBC to the smaller Reelz network which got approximately 925,000 viewers after NBC refused to air the pageant due to certain remarks from a certain president who used to own the pageant… The 2012 Miss USA pageant had a respectable 6.2 million viewers but ratings for a lot of special events have declined in recent years with increasingly alternative options of what to watch and how to watch them so these numbers are reflective of a societal shift from the heyday of pageantry. The highest rated Miss USA pageant was the 1979 pageant which had 38.1 million viewers when it aired on CBS on April 30, 1979 and that was also the first year at Miss USA that the judges’ scores were shown on screen which was discontinued in 2003, brought back in 2007 and discontinued again in 2011 and although many pageant fans love to see scores, it seems like that may never return. Like the Miss Universe pageant, there seems to be less pageant and more filler and when the delegates are on stage, those time-honored traditions like delegates saying their names and one at a time instead of three at a time competing in swimsuit and gown competitions seem to have been reduced. It’s almost as if we are seeing Miss USA become Miss America and Miss America become Miss USA as Miss America’s format has actually been excellent in recent years and their ratings for the most recent pageant in September 2016 was at 6.2 million viewers. Let’s see if next year things improve. The intro for this year’s pageant was amazing featuring Cirque du Soleil performers from the Las Vegas hit show Michael Jackson ONE set to the king’s hit song “Black or White” but again, I would like to see the delegate introductions not be so rushed with each lady only getting shown for 2 seconds and their names not even mentioned but just the states they represent. I wish they would let them at least say their name and state. I like how Miss America has done this recently with each of the ladies presenting a fun factoid while presenting themselves like Miss USA used to do in the 90s with a fun dance incorporated. The hosts from last year (Julianne Hough and Terrence Jenkins with Ashley Graham doing backstage commentating) returned again and they did a decent job. As for the judging panel, they repeated the concept of a mixed panel of preliminary and finals judges as was done at the recent Miss Universe pageant. The three ladies who served as both Preliminary and Telecast judges were: Brook Lee, Miss Universe 1997, Nancy Lublin and Halima Aden (the first woman to compete at her state pageant wearing a hijab and burkini and has since been signed to IMG as a model). Some debated Halima’s participation as she did compete in the Miss Minnesota USA pageant won by Meridith Gould who placed as 2nd runner up at this year’s Miss USA pageant so although I wasn’t sure if she would be vengeful as a judge, Halima may have been friendly with Meridith which may have helped her get such a high ranking. 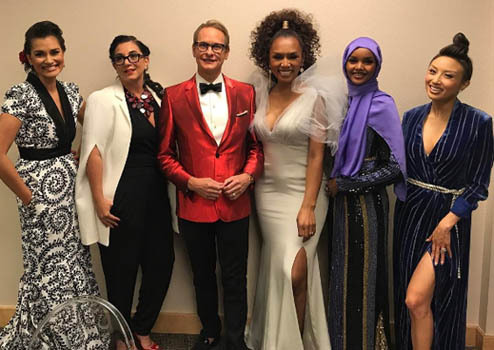 The other telecast judges were some familiar faces: Jeannie Mai, Carson Kressley, and Janet Mock who became the first transgendered judge for Miss USA in the pageant’s history. The remaining preliminary judges were: Vanessa Gringer, Maura McGreevy, Nick Light and Carole Gist-Miss USA 1990. This little video segment with Lu Sierra telling the girls that relying on beauty to win this would not be enough was really hard-hitting and it sent the message that beauty alone was not enough. Again, today’s Miss USA must be an achiever and it looks like IMG wants a spokesperson who has not only the complete package but also more of an unconventional job especially for women to expose and educate people of other fields outside the world of entertainment. After the 10 semifinalists were revealed, while watching with friends, we thought it plausible for there to be an all black top 5 for the first time in history. 2002 had 4 black ladies in the top 5 with 1 blonde and this year, we had three black ladies in the top 5 with 1 Indian and 1 blonde so diversity continues to be the trend and it does seem more evident in some years than others from the 90s onwards. In terms of my predictions, I was fully expecting surprises and knew that interview had more weight counting for 60 percent of the preliminary scores so I tried to take that into consideration and I was actually satisfied with how I did. I picked 6 of the 10 semifinalists (District of Columbia, New Jersey, South Carolina, Alaska, California, and Tennessee) plus 1 alternate (Illinois) and 1 honorable mention (Minnesota). 1 of the semifinalists was in my next tier (New York) and the one I didn't peg was Missouri who is the first African-American to represent her state at Miss USA and as mentioned earlier, she is who I think won the Internet vote. What happened to my 4 ladies that didn’t place? 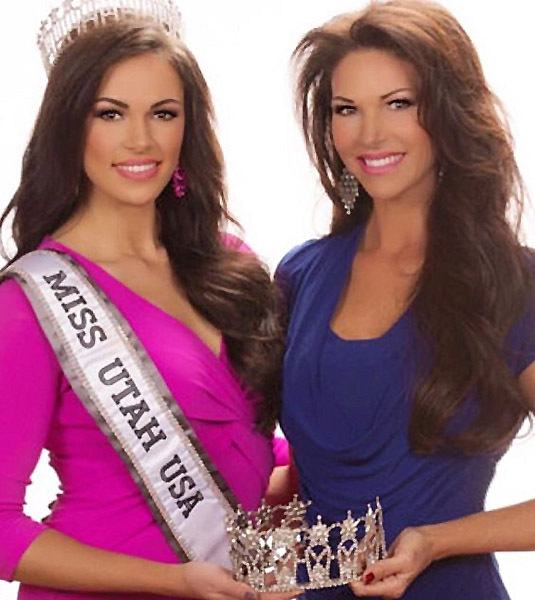 Well, the first one was my winner, Utah’s Baylee Jensen who had more pressure on her than any of the ladies competing this year for the fact that she is the first daughter of a former Miss USA to compete for the title herself! Baylee is the daughter of Miss USA 1989, Gretchen Polhemus, who was the last of the unprecedented five Texans in a row from 1985 to 1989 to capture the Miss USA crown and Gretchen practically ran away with her competition easily getting the highest scores of that evening. A lot of people hoped for the mother-daughter Miss USA co-winner dream to become reality but alas, it was not to be. Baylee’s participation might have been seen as a distraction and they must have opted to take her out entirely even though she inherited some phenomenal genes having a great body but her styling was very 80s with the one piece swimsuit, the broad-shouldered long-sleeved 80s style gown. I appreciated that Baylee dared to be different and perhaps was paying homage to her famous mother but the judges didn’t go for it in the same way that other relatives seem to have fallen victim to this effect like Julia Dalton, Miss North Carolina USA 2015 who went unplaced at Miss USA 2015 even though she is the sister of Miss USA 2009 winner, Kristen Dalton and both are the daughters of Miss North Carolina USA 1982, Jeannine Boger who went unplaced at Miss USA 1982. Even at Miss Teen USA 2015, Connecticut’s Sydney West went unplaced at her pageant even though she is the sister of Miss Teen USA 2012 winner, Logan West. I had a feeling they would do this to Baylee as there have been many years when they take someone out who would have amplified the competition excitement level, like at Miss USA 1998 when two former Miss Teen USA winners (Shauna Gambill and Jamie Solinger) both competed only to have Jamie miss the semifinals entirely and allowing Shauna to get the 1st runner up position at Miss USA 1998. Baylee’s exclusion had me convinced that they do this on purpose but I guess it makes it a little unfair to the other girls when one girl is perceived as having an advantage when she stands out for various reasons like being a relative of a former winner or winning another major pageant so it seems like they want to discourage these types of participants as no Miss Teen USA winner after Shauna Gambill has been able to win a state title to compete at Miss USA either even though many have tried. This might discourage further relatives of former winners from participating. The next one in my list to not place was Pennsylvania’s Cassandra Angst who was a gorgeous red-head like the only Pennsylvanian to win Miss USA (Michele McDonald) who won her crown in 1971 so I thought Cassandra could do it again as she was very strong overall and she did have a great story too about overcoming an eating disorder but they left her out too. The host delegate, Nevada’s Lauren York was my next girl left out and she was another great delegate who also had an amazing overall appearance but her look probably would have appealed more to straight men than a predominantly female panel of judges. Finally, Arizona’s Tommy Lynn Calhoun had an incredible story after getting accidentally tackled while standing on the sidelines of an Arizona Wildcats football game but she landed perfectly and she was a survivor with a great body and overall look and a very nice gown but it was not to be. After each of the top 10 were announced with their video packages shown and interviewed on stage, it was on to the swimsuit competition with a new sponsor this year, Yandy, set to the song, “Something Just Like This” by the Chainsmokers & Coldplay. Minnesota was a divine long-legged dancer who humorously talked about working in graveyard not being very lively. I wish I had her ranked higher than an honorable mention because she was a great delegate but having one judge who had competed against her threw a wrench into my perception of how they would judge her. New Jersey was actually quite stunning with a nice overall look and her Bharatnatyam dancing made great visuals for her video package and the factoid she presented about Indian women like her great grandmother being married off at around the age of 10 helped educate people about how things were in different parts of the world. 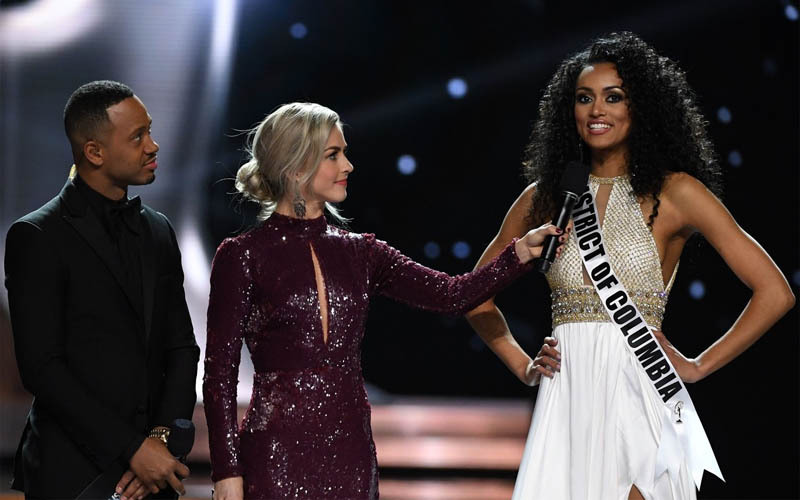 Kudos to her for being the highest ranking Indian woman at Miss USA as 1st runner up and should Kára McCullough win Miss Universe, Chhavi Verg might become the first Indian Miss USA. Missouri was next and she was the big surprise of this pageant being the first African-American to represent her state, Bayleigh obviously possesses a great personality but she was not expected to advance to the top 5. I liked her little motto presented when she was interviewed and said her favorite city is Paris and that mantra was ‘she gets tossed by the waves but she never sinks.’ Tennessee was up next who studies entertainment law and was also respected for that in this pageant and she is also acting, she intelligently mentioned that whether in acting or being a lawyer, they share the responsibility of believably relaying a narrative to an audience be they viewers or a jury. Unfortunately, Tennessee’s body caused her to be eliminated but she was a great speaker and could have done very well had she advanced to the top 5. Next was California who was famously eliminated for the first round of Cycle 22 of America’s Next Top Model. I ranked India highly in my list because I appreciate her diverse background of being part African-American and part Native-American and also speaks Mandarin which I was hoping to hear if she advanced to the top 5 which I was actually surprised that she didn’t because she looked great in swimsuit with a long, lean body and she was also very charming. She also talked about embracing her height, standing tall and feels confident and empowered. District of Columbia followed with that all-important pageant-winning video package showing her participating in her outreach program to educate children about math and science that really set her apart and I really should have seen her win coming. Kára also has a great body and I loved the curls in her hair and it’s actually about time as we haven’t had a curly-haired Miss USA since 2003 with Susie Castillo and of course, my beloved goddess, Lynnette Cole in 2000. Kára was asked who her favorite scientist was and she said Annie Turnbo Malone who was a mentor for Madam CJ Walker. South Carolina followed and as a nurse who held the title of Miss Collegiate America, Megan was very toned and a great speaker so she was worthy. New York was more of a surprise and I had my suspicions about her when seeing her video package talking about reporting on race car driving and being a motorcycle rider herself but there were other delegates I would have put instead even though I understood why she placed. She talked about bringing 35 sets of shoes to Las Vegas needing to be prepared for any situation plus humorously added that a girl can never have too many shoes. Illinois was next and I’m actually really happy that she placed. Whitney was an early favorite when she won her state title but I thought her height would hurt her chances so I only put her as an alternate in my predictions but she ended up making the top 5 so I was happy for her as she is amazing with a very fit body and wonderful overall appearance. I actually really liked the jacket she wore with her swimsuit as it was a cool look. She also had a wonderful message about pursuing your calling no matter what it is and it was mentioned that she has appeared three times on the FOX show ‘Empire’. Finally, Alaska was the last of the top 10 and north to the future is their motto! Alyssa brought that long awaited placement to the northernmost state since 1990 when Karin Meyer got their last placement prior to Alyssa making the top 6 that year. My friend Dave pointed something out to me that I didn’t even think of was that I ranked Alaska 9th in my predictions and Rupaul’s Drag Race is airing their Season 9 this year in 2017 (not counting the All Stars season) but the most recent Allstars edition last year was won by a contestant named Alaska with another contestant named Alyssa Edwards competing and Miss Alaska’s name happens to also be Alyssa so I thought that was a neat connection. Alaska really used her partial Native heritage to her advantage and she had a great body and overall look so I was pleased to see her end the drought. A lot of people pointed out that she fumbled a bit when taking her position at the end of her swimsuit walk. At least with this year’s changes, there was no elimination after the swimsuit round and all of the top 10 got to compete in both the swimsuit and gown competitions which also hadn’t been done since 2003. The more gowns, the better! Accompanied by a performance from country singer, Brett Eldredge, the ladies came out starting with Minnesota in that unique pants-gown which was interesting but looked nice at the same time. New Jersey followed in a black and green sparkly number that was really divine. Missouri followed in a red gown that I thought could have been better structured. Tennessee’s sparkly champagne-silver gown was exquisite and the perfect choice for her. California followed in a white, long-sleeved gown with silver criss-cross patterns over it. This gown got mixed reactions but I think it was a nice choice. District of Columbia’s gown was lovely and the way it floated on stage just made her look heavenly. South Carolina’s royal blue gown was nice was a more classic design. New York’s green gown was very springy. Illinois’ gown was really nice with the way the gold fringe moved on the skirt. She reminded a lot of people of last year’s winner, Deshauna Barber with this look and overall style. Finally, Alaska wasn’t punished for a costumey presentation that most of us crave and want to see more of during gown competitions. She came out with the train over her like a Native outfit with embroidered Native designs to dramatically reveal the lovely red gown underneath. After the top 5 were announced, it was on to the question round. Minnesota was asked, “As Miss USA, you’ll be representing our country worldwide, how would you like the global community to view the United States?” Minnesota answered, “The United States is a community full of leaders who are not only held accountable for their actions but are people who are bound together to make sure that we are able to carry out our rights as American citizens. We are a community that is accepting. We are a community that is empowering and we are a group of people that is not ashamed to lift other people up.” I think she was prepared for this question but this was a strong answer delivered well. Illinois was next and was asked, “Advocates of women’s rights have been leading the conversation this year. Which specific issue regarding women’s rights is most important to you?” Illinois responded, “The most important issue… is being able to be open and speak honestly about your experience in whatever workforce that you are in. Women should be able to speak about their experience without being scared of retaliation for what they have to say and everything that they have to say should be investigated to the fullest extent and both parties, the accused or the accusee should be protected in the process. Thank you.” Another strong answer but perhaps wasn’t specific enough. South Carolina was asked, “Suicide recently became the second leading cause of death for teenagers. What actions would you take as Miss USA to help struggling teenagers?” South Carolina answered, “Most of those who commit suicide are people who feel like their voices aren’t heard. Are people who feel like whatever problems they’re going through won’t be overcome. I believe that what we can do to really, really eradicate that is to make sure we’re creating an environment where our teenagers and those who feel that they need help are… their voices are heard and that we are there for them. We need to set up counselling and other resources for these people to have so that we can get rid of those suicide problems.” District of Columbia followed and was asked, “Do you think affordable health care for all U.S citizens is a right or a privilege and why?” DC said, “I’m definitely going to say it’s a privilege. As a government employee, I am granted, um, healthcare and I see firsthand that for one to have healthcare, you need to have jobs. So therefore, we need to continue to cultivate this environment that we’re given the opportunity to have healthcare as well as jobs for all the American citizens worldwide.” So this is a polarizing topic and there are people that feel strongly on both ends of the spectrum and like many contestants in the past, Kára gave her opinion and presented and defended it well. Finally, New Jersey was asked, “Social media allows us to share every aspect of our lives but it can also cause us to be hyper-aware of how we measure up to others. Do you feel that social media is ultimately positive or negative?” New Jersey answered, “With social media, I believe it has given us so much power in this world. But with great power comes great responsibility and I’ve seen both ends of social media. For me, it has been one of the most empowering experiences because I’ve met so many empowered women. But at the same time, I’ve also been a victim of cyber-bullying like many of the contestants with me standing on this stage. Social media is again a privilege. It’s something that you have to be careful of. You can’t just say anything just because you’re anonymous and once when we realize that, that’s when we can truly live in a better world for everyone.” I think she handled this question very well and gave a wonderful answer. South Carolina was the one that stumbled a bit on her answer so with these strong answers I knew she wouldn’t advance but the other four had a shot. Unfortunately, it was Illinois who was also eliminated here. However, all of these top 5 delegates were tremendously well-spoken so it is time for a return for these ladies to give intelligent answers like they did in the 90s and be good examples and role models and not viral video moments during an era when various contestants that made the top 5 couldn’t always string together a coherent answer. Emphasis on interview is bringing back strong final answers and contestants of which we can be very proud. I feel like the Trump era with less emphasis on intelligence led to a dumbing down of many of the contestants causing those viral video moments but now that intelligence is back, brilliant answers can once again be formulated and appreciated and these contestants who possess beauty and intelligence and have strong examples of achievements will in turn set a good example for the next generation. Then it was on to the final 3 who answered the same question, “What do you consider feminism to be and do you consider yourself a feminist?” DC answered, “So as a woman scientist in the government, I’d like to lately transpose the word feminism to equalism. I don’t really want to consider myself… I try not consider myself like this like die-hard, you know like, aw, I don’t really care about men but one thing I’m going to say is though. Women, we ARE just as equal as men when it comes to opportunity in the workplace. And I say firsthand, I have witnessed the impact that women have in leadership in the medical sciences as well as just in the office environment so as Miss USA, I would hope to promote that type of leadership responsibility globally to so many women worldwide.” This answer was hard to transcribe as it was somewhat scattered but we got the message and it was a good one. Minnesota’s answer was, “Modern day feminism is not only about supporting other women. It is about being any gender in this entire country, in this world and not being afraid to lift those up around you. It is about being unapologetically yourself. In this pageant, we have incredible representatives of what it means to be a woman whether they are on this stage, hosting this pageant with us or judging the contestants on this stage.” This was also a decent answer but perhaps not as strong as the other two. Finally, New Jersey answered, “Feminism is striving for equality and I do consider myself a feminist. I think it’s a misconception when people believe that feminism is women being better than men but it’s really not. It’s a fight for equality and we need to realize that if we want a stable society, a better future for every single individual, we need to be equal and that’s why I advocate for education for women because women are still held back in places of the world. They still don’t have that right to their independence, that right to their equality. All because of education and once we do take that step, I believe that an equal world will be a better world.” This was the best answer of the 3 but still I knew the final vote would take the judges’ overall impression into account so DC being the scientist gave her edge and so she pulled off the win over New Jersey. After Pitbull’s performance with Stephen Marley and the final look of the top 3, Deshauna Barber looked great sporting that afro-hairstyle when she did her farewell walk. Then it was announced that Minnesota was 2nd runner up, New Jersey was 1st runner up and the District of Columbia did it two years in a row thanks to Kára McCullough who is now Miss USA and has a strong possibility of becoming the next Miss Universe later this year. Will Kára be the 9th Miss USA to win Miss Universe? Also could there be a possible new crown? Shortly after the Miss USA pageant, there was a lawsuit filed by IMG against crown sponsor DIC which is the Czech-based company that signed a 10 year deal but missed two payments but kept advertising its ties to the pageant. This might explain why the old Diamond Nexus Labs crown was used to crown Miss Teen USA 2016, Karlie Hay and that Katherine Haik, Miss Teen USA 2015 was the only one to wear the DIC crown that some said looks like barbed wire but is actually supposed to look like stars. Miss Universe and Miss USA after that were still crowned with the DIC crowns so it could be possible to either return to an older crown like the iconic ones last used in 2001 or maybe even an entirely new crown so we’ll see what the future holds.